The Arab Turmoil: Where Do We Stand? As costly as it has been, one thing is for sure, the old Middle East paradig is unlikely to be resurrected. Seasons come and go, yet Arab countries are in ongoing turmoil. They called it an "Arab Spring," but even if that "spring" had ever existed in the shape and form that the media portrayed it to be, it never really lasted. It has now morphed into something far more complex. But it is not an "Islamic winter" either, a foreboding term favored by Israeli policymakers and analysts. The Islamic dimension of Arab rebellions -- some of which turned into bloody civil and regional wars -- should have been palpable from the very start to anyone who cares to understand political reality beyond its usefulness as a propaganda tool. Islam has been and will always be a component in shaping collective cognizance of Arab nations. Political Islam moved to the heart of the ongoing strife and was a manifestation of a century-long struggle where Islam was a platform of political expression, governance and jurisprudence that has fought against many imported and western-styled trends. Throughout the years, there has not been one successful union between Islam and Arab ruling classes -- successful in the sense that it contributed to progress, rights, and prosperity for all. Islamists were either co-opted or conflict reigned. The atrociousness of the results of these conflicts varied depending on how clever Arab rulers were in their management. In Jordan, low-level discord has always existed between Islamic opposition parties and the ruling class. It teetered between partial inclusion of Islamic forces in a parliament that operated with little authority and occasional spats or political crises of little consequence. However, not all failed experiments came at a relatively low cost. In Algeria, an attempt at harmonization went terribly wrong. The 1991 Algerian civil war lasted for over a decade and resulted in the death of up to 200,000 people. Things were not meant to be so bloody, as it had begun with something rather promising: an election. The ruling National Liberation Front (FLN) canceled elections after the first round, fearing what seemed like an assured loss at the hands of the Islamic Salvation Front (FIS). The promise turned into Algeria's second worst nightmare, the first being its even bloodier struggle for liberation from colonial France. All ingredients were in place for a complete disaster. There was a strong army running the country through a deeply enriched ruling party, an emboldened political opposition that was about to achieve political power using the ballot box, and a thoroughly frustrated public eager to move beyond the tired slogans and economic disenfranchisement. Additionally, a radicalized generation of youth existed as they had serious doubts about the sincerity of the ruling class in the first place. The canceling of the elections was the final straw, and bloodletting seemed as though it were the only common denominator. Even now, Algeria is still entrapped by the consequences of that very conflict as it sits at a political standstill without much of a roadmap to anywhere. Despite one's insistence to evade generalizations, knowing how some media tend to lump all Arabs and Muslims into one convenient discourse, the similarities between the Algerian and Egyptian experiences are simply uncanny. On January 25, 2011, Egyptians revolted with the hope that they could finally break the chokehold of the ruling elites: The National Democratic Party, with its adjoining business class and the army, which operates its own massive economy within the larger, haggard, Egyptian economy. 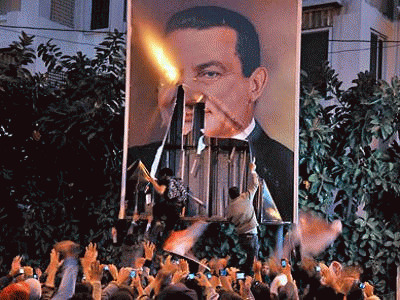 But by extension, the revolution could have targeted the larger regional and international conglomerate that aided and abetted the Hosni Mubarak regime and his massively corrupt power apparatus. Indeed, without an elaborate benefactors' network, the United States being in the lead, Mubarak would have never managed to sustain his reign for over three decades. Egyptians however barely had the time or the resources to develop much of a foreign policy agenda, as their revolution faced too many obstacles and decided attempts at sabotage. On one hand the army was still in charge, although it branded itself as if it were the guardian of the nation and its revolution by using the same old corrupt media. On the other, there was never a cohesive structure that would allow Egyptians to translate their collective aspiration into anything tangible. The only available forum was that of elections and referendums, and every single one was squarely and democratically won by Islamic parties. Fair and transparent elections maybe, but their results allowed the Mubarak regime to resurface. Using its never dismantled infrastructure, notwithstanding a most corrupt media owned by powerful businessmen, and with the army playing a dubious role, the old regime managed to turn the revolution against itself. It cleverly sold the June 30, 2013 protests as if they were a call to correct the wrong path taken after the January 25, 2011 revolt. In a strange turn of events, millions of those who protested against Mubarak were back protesting against democratically-elected Mohammed Morsi, allying with the very political forces that wrecked the country for many years, calling on the same army, and siding with the "baltajiya" -- thugs who terrorized protesters merely two and half years ago. Egypt is now taking its first steps towards becoming another Algeria during the civil war. Do the coup leaders truly understand the repercussions of what they have done? 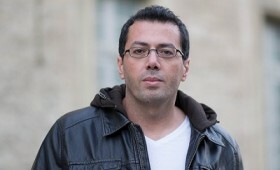 Tunisia, that small nation that inspired the world in Dec. 2010, is not far behind in that sad saga. A recent assassination, this time of nationalist politician Mohamed Brahmi, followed an earlier assassination of another high profiled politician, Chokri Belaid. Tunisia stands divided between those who want to topple the government, and those who insist on its democratic right to govern. Either way, there is no doubt that some suspect hands are trying to push Tunisia into an abyss that is being marketed as Islamists vs. secularists. Syria has been the most bloody example by far. Although in the Syrian civil war, the stakes quickly became much higher, and along with the pertaining discussion, the war rapidly took on a dangerous sectarian conflict whose implications are felt near and far. In some sad way, the Arab regimes are making gains. Some are doing so through war, others through military coups, and some are actively plotting in hopes of making their move soon. As costly as it has been, one thing is for sure, the old Middle East paradigm, of powerful elites backed by formidable allies, oppressing weak, dismissible peoples, is unlikely to be resurrected. There will be more blood, but a return to the past is surely a thing of the past.